Download the CITY OF WINDSOR PARKING APP to pay for your parking online! 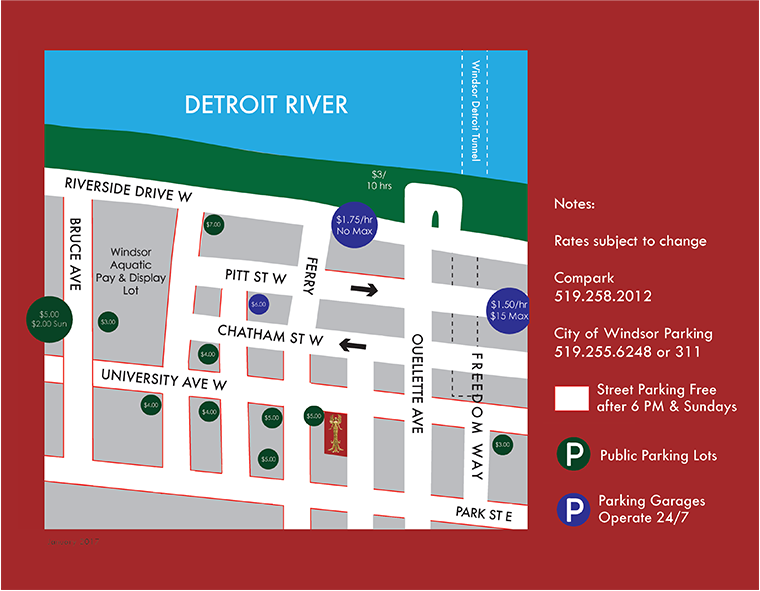 After clearing Customs, move to the extreme right of the plaza and look for the “Downtown Windsor” sign. Follow the curve (Huron Church Road) and head back toward the river. Turn right onto Riverside Drive and continue to Ouellette Avenue. Turn right on Ouellette and go three blocks to University Avenue. Turn right on University, the Capitol Theatre is one block ahead on the left. After clearing Customs, turn left onto Park Street and immediately move to the right lane. Turn right onto Ouellette Avenue (first light). Follow Ouellette Avenue one block to University Avenue. Turn left onto University. The Capitol Theatre is one block ahead on the left. Take Dougall Ave and Hwy 3B/Ouellette Pl to Ouellette, turn West on University Ave W.